IS WIND SAILING GOOD FOR TREES? Some tree experts seem to think ‘wind sailing’ is a great way to save your trees from wind damage. You may have heard about this fabricated notion of thinning limbs from trees in order to make them stable for wind storms. 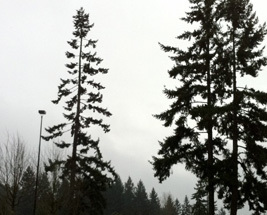 This improper pruning technique is promoted to supposedly make trees safer in the wind by allowing wind to pass through the canopy of a tree, thus reducing movement and strain on a tree. Not so! This may sound reasonable and may even seem to have some logic behind it. But beware; the truth is that there is really no scientific study that definitively shows thinning to increase resistance during a wind storm. Actually, many studies have shown that the outside limbs can divert some wind from the center of the tree and act as a buffering shield. Aggressive thinning, on the other hand, can make the remaining branches more vulnerable to failure, now that they are isolated and must take on the elements alone. As a result, the practice of pruning out a major portion of a tree’s canopy for the sake of staying upright during a wind storm is, in reality, harming most trees in the long run. is aggressively wind sailed, it no longer bends or moves and thus no longer builds up holding wood or necessary anchoring roots. Wind sailing can create a false sense of security in the stability of a tree. Most trees that have not been damaged by human interference, root rot, bugs, or disease are more than capable of withstanding our region’s fiercest windstorms. It is the trees that do not fit into any of these categories that we should be most concerned about. If your tree is unstable, there may be methods to keep it safe and improve its health. Be sure to contact a certified arborist for any tree advice. And don’t even consider topping a tree. It’s just a death sentence for that tree. It’s much better to remove the tree and replace it with a more suitable tree that is appropriate for its surroundings. Check out how the resources the Washington State Department of Natural Resources offers to tree owners through its Urban and Community Forestry Program.